Just wanted to quickly announce May/June’s Word Master. Although I had to pick between three awesome entries, in the end, Magaly Guerrero’s Entry absolutely fulfilled every criterion I’d set for the Challenge. She’s picked the 10 chapter crit as her prize, and looking at her mad writing skills, I’m definitely looking forward to reading more of her work. Thanks again to all who’ve entered! My next Word Master Challenge will be up next week. Seriously. Is it Thursday already? Well… I don’t see my workload as getting any better in the near future. Which, of course, means that I won’t be able to do a News Day either. So. I think I’m going to let it fall away. Instead, I’ll try and post one or two interesting links whenever I find something worth sharing. I’m really sorry to do this, but I just need to make life easier on myself somehow. BUT! For now, the Paying Forward Awards and the Word Master Challenge will be continuing for now. Here’s a recap, for those of you unfamiliar with these two events. If you are interested in taking part, please contact me at mishagericke(AT)gmail(DOT)com with “Paying Forward” as the subject. You have until 23 June 2013 to volunteer. PLEASE NOTE!!! Don’t enter your link until you’ve written your entry. I want to be linked directly to your Word Master Challenge Post. NOT to your blog’s home page. Also, please make it clear that the entry is in fact for the Challenge. I don’t want to wonder about this later. Easiest way to do this is to copy/paste the badge above. Or to start the post’s title with “Word Master Challenge“. Go to this link to enter. So yeah… that’s me for today. I’ll be having to rethink my blogging now, because I need to fit it into many many other necessary activities. Any suggestions? Okay! Now I really feel like April is over and I’m getting back to my regular schedule. BUT I learnt from when I went to Berlin. There’s no chance of me doing regular postings from 13 to 24 May as I’ll be in Europe again. So… that leaves me unable to plan a Paying Forward Award or Word Master Challenge. So. What I’m going to do is this. I’m going to start collecting prizes for the Paying Forward Awards from tomorrow. For the end of June. Which means this will be the biggest awards to date. As always, I’ll need your help, so please start thinking of anything you have to offer that will make things awesome for another blogger. I’m more than willing to reciprocate by hosting a guest post by you or interviewing you or something like that. As for the Word Master Challenge, I’ll open it on Monday. Who’s excited for MFB’s return to normal? Hey all! Just wanted to let you know I’ll be writing tonight, so I’m just going to re-post the theme for the Word Master Challenge. For more information and to enter, please head over here. There are prizes to be won, so I really hope some more people get a chance to enter. Pick your favorite place in the world. What does it look like? What’s the mood like? You can have 50 or so words to create an introduction. The entry itself must be no longer than 300 words. 3) Effective use of senses. Interested? Then write me something awesome and enter. Hey all! Welcome to this Month’s Results post. Before we get to what I think everyone really wants to know, I just want to write a quick note about the Word Master Challenge. I think I gave people too little time to enter this time around (only two weeks) and it is a rather more challenging theme, so I decided to postpone the deadline to 31 March. If you don’t know what the Challenge is about, please go check it out. The entry is 300 words or less and you have a month to enter. The winner gets to pick between a $10 e-voucher, a crit on the first 10 chapters and (because I now discover I love doing these) a query crit. Interested? Get writing, lovelies! Right, now to the BIG news. Thank you to each and every one of you who sponsored, nominated or voted for the awards. You all made it twice the size it had been in January. Which makes you all amazing people. Now. Before I announce the winners, I just want to do a recap of how the prize claims work. Winners must contact me at mishagericke(AT)gmail(DOT)com with either “I came first” or “I came second“. I will then assign prizes on First places, First come first served basis. In other words. First prize winners get priority in the order that they contact me, followed by second prize winners in order that they contact me. I then assign prizes according to what people want most, second most etc. until all prizes have been assigned. First place winners who don’t contact me within a week will forfeit their place to the second place winners. Congrats to you all! You definitely deserve some kudos! Before you go, I just want to appeal to your heart. The Awards are growing and crawling into people’s hearts, but for me to keep it going I need your help. If there’s anything you’d like to give away to make someone’s day, please become a sponsor for the month. I give you special mention when I open nominations and we can even arrange a guest post in return. Literally anything is welcome. From your e-book to crits, to vouchers, to beta reads and anything in between. Anything you think someone else would like. If you’d like to help, please contact me at mishagericke(AT)gmail(DOT)com with “Paying Forward” in the subject line. Thank you in advance! Yes, ladies and gents, I decided to write an entry for my own challenge. Naturally I can’t win, but I picked the theme after discovering the amazing Berliner Dom. Writing a description has been bothering me ever since, so here it is. The first photo I took on entering the cathedral. The moment I walk into the Berliner Dom, I fall in love. A magnificent painted glass triptych greets me, sharing images from the life of Jesus Christ. They glow in marble and wood, brightening what should have been a dark church on a cloudy day. I lose myself in my majestic surroundings, and then something magical happens. A tenor starts to sing, practicing for his role in the St. John’s Passion. Soon, the floating, pure notes of a soprano joins him. 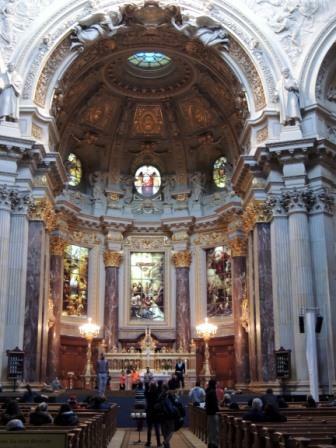 Music fills the cavernous cathedral, the sound multiplied perfectly by the acoustics, bouncing off strict statues of Calvin, Luther and other founders of the protestant church. I get goose bumps as I try to take everything in. The fine gold filigree, edging murals of gentle-faced evangelists. The soft, warm light spilling from burning candles next to the beautiful golden altar. The dancers practicing for the Passion. I sit down for a moment to watch the practice, but my attention is drawn away within seconds. The organ looms silent above the graves of kings and queens. More candles burn in their memories. A little to the side stands a pulpit. 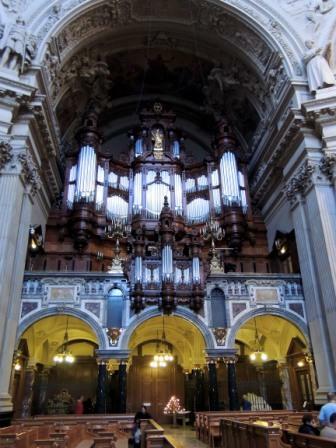 Its wood is the same dark color as the organ’s frame, but instead of being somber it only adds depth to the splendor around it. A big golden cross crowns the pulpit’s canopy. Every inch of the cathedral has something to see. A sense of absolute devotion permeates everything. That the very best had been given and done to God’s glory. Maybe that’s what gives the space such a presence. Or maybe it’s the feeling that the church is secretly sentient. It’s as if the church breathes on its own, living to speak to those fortunate enough to enter it. When I leave, it invites me to come back. There you have it, ladies and gents. What do you think? 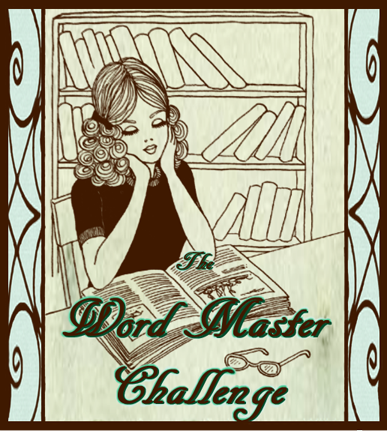 If you also want to enter the Word Master Challenge this month, you have until Sunday. Click here for more details. Also, today is the last day to vote for your favorite bloggers, so don’t forget to do so if you haven’t yet.